Live From Arnhem, Holland: Vineyard Music EXTRA! Please note: reviews are the personal opinions of the author. That is why we publish most of the reviews received. If you don't like this review, please write your own one. I have been particularly gripped by the fact that God has anointed a bunch of potential rock and rollers and turned them into gentle and reverent worshippers of God, bringing them into the Presence behind the veil. How wonderful for God to take what could have have been rebels and outcasts, and call them as though they are, when they surely must have been nothing apart from Him. How refreshing and precious is the love of God that passes understanding to bring powerful anointing upon an unlikely group of musicians. 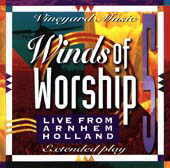 Thank you Vineyard Music Group for Arnhem Holland Winds of Worship #5. For letting the children play their guts out with genuine passion for Jesus. Thank you for not removing the children from Jesus lap, even when their expressions of worship are loud and untraditional. Let the children play with their Father. The international flavor of this recording reflects the heart of God for the nations  not merely for one particular country. You have redemed us to God by Your blood out of every tribe and tounge and people and nation, and have made us kings and priests to our God. The presence and power of God moving among the entire gathering is awesome. This is definitely a recording to listen to with headphones in solemn time of seeking the face of God. Be prepared to dance wildly beside king David of the scriptures! Robert Evans <evans1@compuserve.com> is a PC/Network administrator at Purdue University in Indiana, USA. He is also a musician who loves to put scripture to music.